John Emrich has been a professional drummer and percussionist for over 37 years. 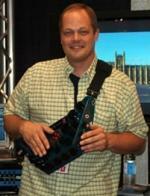 For twenty of those years, he was a featured performer with The United States Navy Band in Washington D.C. As his skills continually developed and he considered a career as a full time professional musician, he realized electronic instruments and knowledge of professional audio equipment was essential for his advancement. He was never happy with the audio quality of module based electronic drums, so he started producing his own sounds. This eventually lead to his work as a Sound Designer for FXPansion on the BFD2 platform, top electronic drum manufacturers, and writing for Modern Drummer Magazine. Over the last five years, John has distinguished himself as a top producer of drum samples for VST libraries and electronic percussion instruments. "I have come to rely on Violet Microphones for every project that I am involved in. They have become by go to microphones for every project that I produce. The Flamingo Stereo is an outstanding stereo microphone that I prefer for my drum overheads. The Globe has proven itself to be an exceptional close mic for toms and smaller bass drums. My standard approach to snare drum now includes the Wedge. I use it positioned on the shell of the drum and get an outstanding balanced snare sound. The best thing I ever did was to get my hands on a set of VIN50 capsules. These microphones are some of the best room microphones I have ever used. Their high gain structure and tonal qualities are wonderful for distant microphone placement." Whether producing sample libraries or playing sessions, John has come to rely on Violet microphones. "It only took me about five minutes to realize that [Violet Design] are exceptional microphones. I was immediately impressed with the detail, sound quality, and affordability. As a sound designer, I look for a true representation of the source that I am recording. Violet Design microphones give me that." "As a sound designer, I look for a true representation of the source that I am recording. Violet Design microphones give me that." "The Flamingo Stereo is an outstanding stereo microphone that I prefer for my drum overheads." "The Globe has proven itself to be an exceptional close mic for toms and smaller bass drums." "The best thing I ever did was to get my hands on a set of VIN50 capsules. These microphones are some of the best room microphones I have ever used. Their high gain structure and tonal qualities are wonderful for distant microphone placement."